Seeds of Hope | Kid Reporters' Notebook | Scholastic Inc.
Conservationist Jane Goodall, known around the world as “Dr. 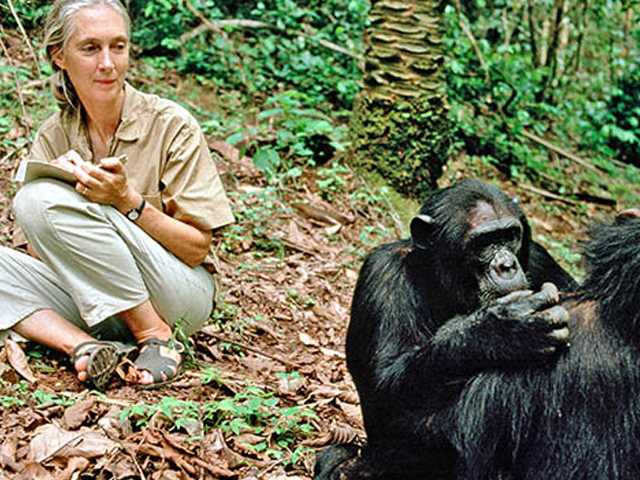 Jane,” studies chimpanzee behavior in Gombe Stream National Park in Tanzania in 1990. In 1991, conservationist Jane Goodall sat down with a dozen frustrated teenagers in Tanzania, a country in East Africa. Goodall recalls the teenagers saying to her, “Your generation has compromised our future, and there’s nothing we can do about it.” These teenagers inspired her, and together they created a program that is still making the world a better place 26 years later. Goodall, who is one of the world’s most famous naturalists, is known for her unique method of living in the wild while conducting research. Her work has changed the way we view animals. For example, when Goodall began studying chimpanzees in Tanzania’s Gombe Stream National Park in 1960, she discovered that chimps make and use tools, just like humans. On March 16, Goodall visited with young people, including this reporter, in New Orleans, Louisiana. The conservationist addressed elementary, middle, and high school students at the Academy of the Sacred Heart. Later, she spoke at Tulane University. Goodall explained why she and those 12 teenagers in Tanzania started a youth program in 1991 called Roots & Shoots. They wanted to demonstrate that “every single one of us matters and has some role to play” in healing the planet. Goodall told me that her goal is to have “every child on the planet” participating in the Roots & Shoots program, which now has members in 97 countries.